I'm one of the luckiest people in the world to have been born where I was and to be doing what I am. This last weekend was truly fantastic. Great country, great people...great gold! I decided to take advantage of the long weekend and my new Bombardier Traxter ATV to make a run up to the Fortymile country in search of gold. The plan was to head up Friday, get in a couple days of detecting, and get back to town on Monday. The drive up was uneventful though long at 400 miles. I saw a few moose along the way and stopped in Chicken to visit a bit. There were still patches of snow in the high country between Tok and Chicken but the snow was gone in the Chicken area. My travel rig is a Toyota 4-Runner with Bombardier Traxter behind on single place trailer. The trailer is neat because I can also pull it behind the ATV on good trails. The second picture is the Traxter off the trailer ready to go. I have an oversized suitcase that believe it or not has my GP Extreme with 18" and 14" coils, Infinium with three coils, Shadow X5, and all sorts of detecting accessories, plus extra clothes all in it. I just strap it on back and everything is protected. The Traxter has a large storage box up front and all my food/canned goods are there. A couple picks and my 12 gauge shotgun are strapped on front. I carry a rucksack with things like GPS, camera, binoculars, first aid kit, etc. One reason I chose the Traxter was that I have heard too many tales of people losing ATV's crossing streams, and as a larger, heavier unit it is better than most in that regard. I had a winch installed for this trip as visions of having this rig stuck in a mud hole miles from help and by myself haunted me before I left. As I got ready to head out I turned around and there was a black bear watching me. For all the bears I see I have yet to get a decent photo of one since they always run off too soon. I managed to get a picture of this one at least before he took off. Then off I went down the trail to the river crossing. Despite the snow melt the water was low so no problem at all driving the Traxter across. I got to the claims where I had permission to hunt a bench deposit high above the creek itself. The owner was curious as to what was there, so the plan was for me to flag the locations where I found any nuggets. If it looked good enough he was considering doing some mining on the site. 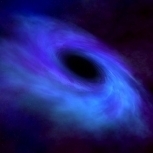 I played around with the Shadow X5 and Infinium a bit, but really there was no point in having brought them along. 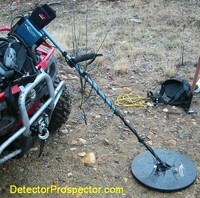 I had the Minelab GP Extreme outfitted with an 18" coil and I knew it was the machine to use to get the gold. And get the gold it did. Despite having detected this location in the past I immediately started popping nice, fat nuggets out of the ground. While I am at it, a fierce little snow squall blew in and plastered me with sloppy wet snowflakes for awhile. Luckily it did not last long. I dug a bit of junk but mostly gold. The picture below has a half dozen locations flagged where I pulled up nuggets. The size of the gold and the fairly small area I found them in made it look like this spot might be worth mining. 2011 Update: The miner later did just that and the location paid off fairly well. The weekend went too quickly and soon it was time to head back out. The weather had taken a turn for the worse and when I got back to the river crossing the water was so high I just stopped and stared for a very long time. I could not bring myself to attempt the crossing and turned back. Luckily there was an alternative trail out to the road, although much longer, which allowed me to avoid the river crossing. Better safe than sorry and so after a much longer ATV ride than I had planned I made it back to my truck. A bit of time to load up and make the long drive back to town. 2.32 ounces of Fortymile gold! It was all worth it of course. Not only was it a great adventure, but I did very well on the gold. Not so many nuggets but they are all solid slugs which add up fast. The results above are 2.32 ounces of nice, solid Fortymile gold, the largest nugget weighing in at 8.7 pennyweight. Hard to beat that for a couple days of detecting!